The Dragonoid Colossus is an ultimate weapon of the Dragonoid Bakugan in season 3, Bakugan Battle Brawlers: Gundalian Invaders. It is like the Maxus Dragonoid, only battle gears are used to form the Dragonoid Colossus, not Bakugan Traps. This is also considered as a Mobile Assault Vehicle, because it serves as a power-boosting vehicle to the Bakugan. 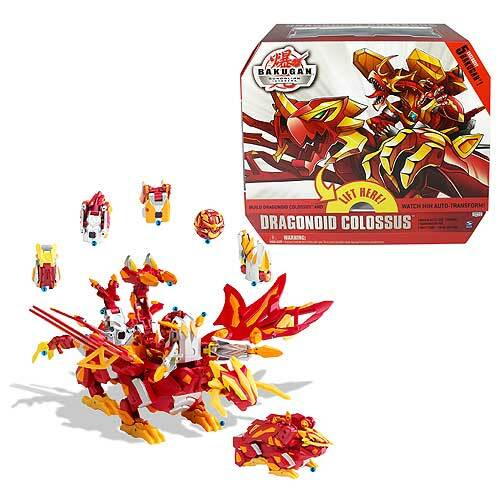 Dragonoid Colossus is one of the most powerful, ferocious, Bakugan monsters in the universe. Equipped with multiple Bakugan Battle Gear, his Pyrus-based attacks are capable of extreme destruction. His hi-tech armor can withstand even the most powerful of attacks. The Dragonoid Colossus is unique wherein the whole thing opens up as one after putting together all battle gears on the Transformation Hub. They will remain close until you drop the closed core Dragonoid Bakugan into the center of the hub. 1. Let's take a look at the connecting hub first, without the battle gears and the Core Bakugan. Make sure to close the side horns, the top horn, and the lower jaw. 2. Push the head and the neck back until it snaps close. 3. Rotate the wings upward and lock them into place. Gather them as one, rotate them and snap them into the body. Repeat this for the other set of wings. 4. Rotate the rear feet down, and rotate the rear leg up to body. Do the same for the front legs. You will then have a fully closed Dragonoid Colossus! .. For the purpose of completing the Colossus Bakugan, however, let us extend the legs. 8. Drop the Battalix Dragonoid into the center of Hub and see the whole thing open up! 9. Open the Axator Gear and then put it in front of the now finihsed Dragonoid Colossus. The Dragonoid Colossus CANNOT be used in actual battle. We can use each of the pieces that make up the Colossus Bakugan --- Battalix Dragonoid and the battle gears --- as regular Bakugn individually. But not the whole thing. The Battalix Dragonoid and the Battle Gears have G-Powers nd can be used in battle like normal Bakugan. As a whole, however, as the Dragonoid Colossus, it does not have a G-Power. Again, the whole thing is not used for battle. The Dragonoid Colossus have a unique DNA code as the Battalix Dragonoid and the Battle Gears do. Use these to upload them into Bakugan Dimensions, and add them to your collection and use them in your online brawls.